Hello, I am a new reader! 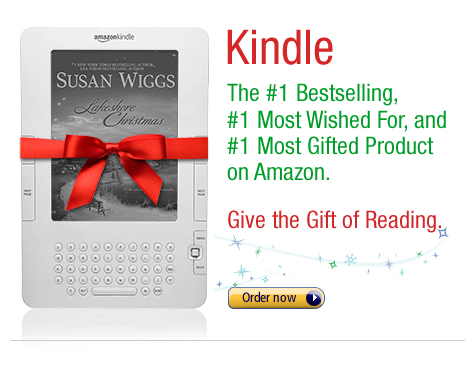 I just wanted to comment to say I read your book on a whim because of the Amazon Kindle ad and really enjoyed it. After that I went to my local bookstore and got Fireside, Just Breathe, and Summer at Willow Lake. Good stuff! I love your style. I’m now a big fan! Oh my goodness! Thank you so much. The reward I’ve been promising myself all month? To go upstairs and read Lakeshore Christmas. On my Kindle. Just wonderful. I must admit, I am considering going over to the dark side-possibly buying one of those things. I love to read a book, turn the pages, anticipating the next wonderful scene or dialogue, but, since I am going away for a month, I cannot take all my favoured books with me. So…there you go, I will advance into to this century of electronic gadgets and will probably buy one. Thankfully the favourite author, SW, and a few others, can be downloaded. How wonderful for you to have Amazon show it with your book on it. So great!